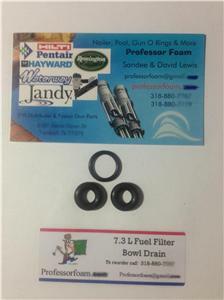 Powerstroke 7.3 7.3l Fuel Filter Bowl Drain Valve O-ring oring Viton CHEAP!!!! The factory o-rings are Buna-Nitrile. Replace them with our Viton O-Rings. Viton will hold up to Bio-Diesel and ULSD. This kit contains 3 black or brown viton O-rings - color has nothing to do with what its made of, Viton is stronger and more resistant to chemicals. Someone who is selling o rings that are brown and calling them viton is mistaken, any type of o ring can be sold in any color, so color is not a trait of Viton! 94-03 Ford F-series diesel engines. Shipping: Kit will be sent in a #10 regular envelope with first class postage. If you want tracking please upgrade your shipping and tracking will be included.